C-Line Data Binder Label Holers offers a great way to keep spineless ledgers and data binders neatly and organized. It creates an easy and simple identification when binders or books are stacked on top of each other. Relabelling is design for easy slide-in system. The Data Binder Label Holders offers durable and strong hold that will remain intact on virtually any clean, flat surface. It's reusable and easy to use making it perfect to store, organize, present and display everything you need. Insert Size: 2 1/2 x 6"
LOVE THE BINDER LABEL HOLDERS JUST WISH THEY WERE LESS EXPENSIVE. 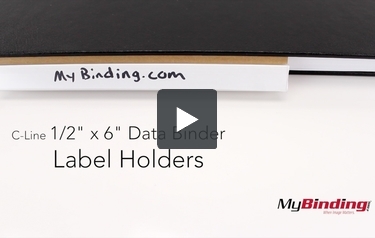 This is the C-Line 1/2 x 6 inch Data Binder Label Holder! It’s a clear plastic holder attached to card stock with adhesive on it. Getting it damp activates the adhesive to then place onto your binder—functioning just like an envelope. Once moist, stick it wherever you like for easy side labeling. It comes with several perforated labels you can write on, or custom print on. Again, the back is not sticky, but when I lick my finger and touch it, then it adheres surfaces. Like magic!